Chile en polvo de California. quick shipping, seem to need this in most recipes lately. 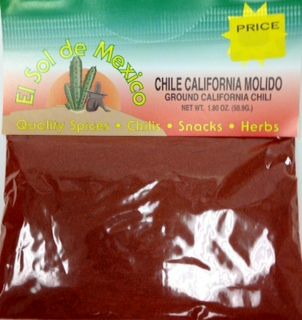 I purchased this with New Mexico chili powder and Pasilla chili powder. I used a combination of all three in a chili cook-off contest and took first prize - so no complaints. All these years I've been making trips back to California to get this and now I can have it shipped to my home in England. How fantastic! There is nothing that can touch as far as flavor than this and California chili by El Guapo! thank you! ConsI grew up in CA too many years ago to count and since older relatives have passed on, I have had to fly from the East Coast or my home in England to get !